Known for their glassware, Abigails has created a murano inspired jar set that we sell in our store for q tips and cotton balls. 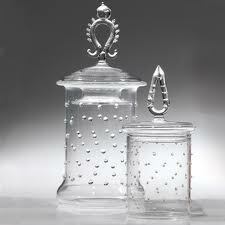 Note the dots on the glass and the handmade top. Great for the bathroom but can be used with candy and other essentials. Dots pattern shown on right.